Some of the more central components of the Imago Dei Youth Ministry are missional experiences and opportunities to be immersed, albeit temporarily, within diverse communities of faith. This often leads us to develop relationships and partnerships with those living in contexts of poverty, homelessness, racism, and other forms of systemic oppression. I confess, it is difficult for me to develop these partnerships, as I recognize that our ability to move into and out of these contexts flies in the face of incarnational paradigms; however, when working with suburban youth, it is not exactly possible to say, "I know you are a minor, but let's all move into X place and make our permanent dwelling here." That being said, short-term experiences are all we have to work with- and the fruits of such experiences are irreplaceable. There are a variety of reasons why students participate in these missional experiences; many are genuine responses to the call to live into their deeply rooted faith and missional vocations. However, without fail, every year I hear parents (and sometimes their youth) explain their participation as follows, "I just want Joe/Beth to realize how much they have and to be grateful for where they live." I cringe as I attempt to paraphrase these explanations and rationales. In other words, not only do we exploit the poor and oppressed in order to arrive at particular situations of luxury, but we also exploit their condition in order to reaffirm and bask in our abundance and comfort. These experiences are what first came to mind when I read through this Sunday's lectionary text and the stark contrast between the prayer of the Pharisee and the prayer of the (un-named) tax collector. The Pharisee, "God, I thank you that I am not like other people: thieves, rogues, adulterers, or even like this tax collector." Said differently, "God, I thank you that I am not poor, that I am not an immigrant, that I do not have a criminal record, that I have never been addicted to drugs, that I am not a minority, that I do not live in contexts of oppression." As long as we bask in gratitude about whom we are not and where we are not we will fail to enter into genuine community with those that are, for to do so may jeopardize that which we have either worked so hard for or just so happened to possess merely through happenstance. Then we hear the (un-named) tax collector, "God, be merciful to me a sinner" and Jesus' exaltation of this humbled other. But who is he? Is this really all there is to this little parable of Jesus within Luke's gospel? If you have been tracking with the gospel story up to this point you know that there is always something more that Luke is bearing witness to, constantly offering hints and guesses to a much larger picture and hoping the reader connects the dots. That's where we need to jump a week ahead to next Sunday's lectionary text: Luke 19:1-10. It is then that we realize, maybe this tax collector had a name after all- Zacchaeus. As with many of Jesus' parables, we in the suburbs have hyper-spiritualized Jesus' parable and even this narrative so much that our crafting of clever nursery rhymes for children has rendered this subversive illustration irrelevant. We think it is nice that the tax collector was humble and repentant in Luke 18; we are quick to affirm his humble heart. We love Zacchaeus because he repents of his sins and turns to Jesus, and we should do the same; we even love that he was "a wee little man." While this is true, there seems to be so much more. 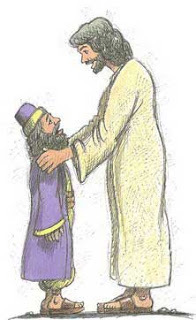 Dare we miss that the humbled sinner and tax collector "standing far off" in prayer is also named Zacchaeus. After much contemplation and deliberation, even confession, he has climbed down from his elevated position in the tree, given reparations for his unjust and oppressive deeds (i.e. repents), and identified with the poor he once exploited. It is only after this sort of repentance that Jesus then says salvation has come to this son of Abraham. Said differently, is it possible that salvation in the economy of God is linked to our concern for and identification with the poor and oppressed? As Luke says elsewhere, "blessed are you who are poor…woe to you who are rich" (6:20,24); "some are last who will be first, and some are first who will be last" (13:30); "for all who exalt themselves will be humbled, but all who humble themselves will be exalted" (18:14). Am I willing to make such reparations? Are we as a people of God willing to incarnate our confessions by actually identifying with the poor and oppressed and moving towards liberation and change? Is the church willing to come down from elevated positions in suburban trees and participate in God's kingdom of reconciliation and peace even though it may cost us much, maybe even everything? Luke's gospel suggests that we open our eyes and ears to see and hear the ways in which we can enter into the community of the oppressed and participate in God's kingdom of salvation. The reality is, we do not have to go very far. We may not even have to leave our neighborhoods, townships, or boroughs. And sometimes we may, possibly for longer than a week over the summer. And surely for reasons far greater than to affirm and give thanks for our contexts of wealth, acquisition of possessions, and statuses of privilege.